MARTINA FRANCA, Puglia, Italy, Oct. 30, 2014 (PRNewswire)/ ‒ Wineries of Italy Consortium, Wine-ICons, launched in the early summer of 2014, is redefining what it means to be a wine consortium. Unlike the traditional wine consortiums made up of producers that only promote wines of a certain region, Wine ICons brings together small, family-run wineries from all over Italy making wines with two very simple goals: help tell their story and introduce these wonderful and unique wines to people around the world. The idea behind Wine-ICons originated a year ago when, Marcello Miali of Cantine Miali in Puglia, Jacopo Di Battista of Querceto di Castellina in Tuscany and Davide Castagnoli of Cantina Braschi from Romagna, traveled to Los Angeles for a trade show. The three producers talked about the challenges of running a winery and wanting to do something to help, from one side, small Italian producers trying to enter new markets without compromising their own roots and traditions, and on the other, giving people around the world the opportunity to experience honest and real Italian wines. Shortly after the trip, Gabriele Marinig of Colli di Poianis, a family-owned winery in Friuli, joined the founding members. Eight wineries now make up Wine-ICons, each with a focus on the indigenous grapes of their area and those best suited for their terroir. The Consortium’s strategy is to offer different wines from producers all over Italy with one winery from each wine region. The Wine-ICons belief is that by bringing out the distinct qualities of each region and each grape you can discover the real essence of Italian winemaking, an experience the group wants to share with wine enthusiasts. Organizing tastings, wine-dinners and seminars, Wine ICons also strives to give wine lovers the opportunity to meet the people and tell the stories behind the wines. Wine Icons wines are already available in many key U.S. markets (New York, New Jersey, California, Illinois, Rhode island and Massachusetts). Despite their initial success, Mr. Miali says, “We know we’re not going to get rich from this, but that’s not the point. We want to work with and support great like-minded, smaller producers and have more of our bottles being opened up and enjoyed by wine lovers around the world.” Cheers to that. For more information, please visit the Wine ICons website (wine-icons.com). Wine ICons is also on Facebook (fb.com/wineicons) and Instagram (@wine_icons). Copyright © Telegraph Media Group Ltd. Copyright © The Hearst Corp.
As I reported last November, the city of Lecce, the capital of the province of the same name, was a candidate for the designation of European Culture Capital 2019. On Friday, European Culture Commissioner Androulla Vassiliou announced that the designation has gone to the historic city of Matera, in the neighboring Region of Basilicata. Matera, famed for its ancient “Sassi City of Stone,” and the location for numerous films and TV programs, is often included in Puglia-based tour itineraries due to its proximity to the city of Altamura. Also in the running with Lecce were the cities of Cagliari, Perugia-Assisi, Ravenna and Siena. The article reports: “A 37-acre olive orchard surrounds the ancient Masseria Bosco, a former farmhouse and barnyard that dates to the 16th century.” The property is located in the Province of Taranto, near the Ionian Sea. PRNewswire ‒ Enovation Brands Inc. announces the addition of Farmers of Wine to its Italian wine portfolio. Farmers of Wine is a project created by Enoitalia SpA, the second-largest volume winery in Italy, in partnership with authentic Italian wine farmers who continue to employ traditional growing methods in a modern wine industry. Farmers of Wine authentic Italian Red Blend is a blend of Negroamaro and Zinfandel (known as Primitivo in Italy) from Salento in Puglia. 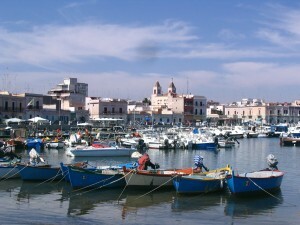 Located between two seas in southern Italy, Salento is a region rich in history and culture. The Italian start-up Blue Wings Air is scheduled to begin scheduled flights this winter between Foggia, in northern Puglia, and destinations in northern Italy. Alessandro Gallo, owner and chef of the Gallo Restaurant in Trani, Italy, and Alberto Longo, owner of Alberto Longo wines in Lucera, Italy, join Roseanne Colletti to talk about Puglia Food and Wine Restaurant Week taking place this week Oct. 6th-12th. Treat your palate to tasty servings of Puglia-inspired appetizers, entrees and desserts complete with wine pairings created to introduce you to a region in southeastern Italy hailed by National Geographic Traveler this year as a “must-see” destination. Rich in culture, cuisine, wines, architectural treasures, leisure and sports activities, white sand beaches, mountainous vistas, Mediterranean beauty and spa specialties and Old World hospitality. 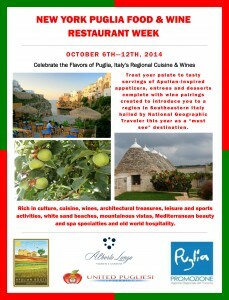 Apulian Roots in Altamura, Italy, the United Pugliesi Federation of Greater New York, Alberto Longo Vineyards and the Regione di Puglia are joining together for a weeklong celebration of the foods and wines from the provinces of Puglia, Italy (Oct. 6-12) with the support of the New York State Restaurant Association. 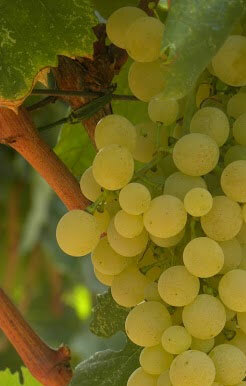 • Create and serve a Pugliese food and wine menu. • Circulate wine promotional materials at bar and reception areas. This will be provided by distributors. • Provide staff with talking points about food and wine. This will be provided by event organizers. • Distribute gift bags for select customers. This will be provided by United Pugliesi Federation of Greater New York. Participating restaurants will be listed in event materials and included in press release and promotional articles. In addition, restaurant owners and managers will be invited to the kick off event. For more information and to get started participating, please contact Kate McGrath at kmmomcgrath@gmail.com. You are currently browsing the Puglia Connection Blog blog archives for October, 2014.